"What is the Sacrament of Holy Orders?" "What is the Sacrament of Holy Orders?" Jesus chose twelve men to be apostles. After His ascension, the apostles had the important mission of spreading the news about Jesus, but they were lacking one member. At a gathering of the disciples, Peter told the group that a replacement for Judas was needed. The man to be chosen needed to have been a witness to Jesus' life, death, resurrection, and ascension. Two men were proposed, Justus and Matthias. Peter and the apostles prayed for the Lord to show them whom to choose. Matthias was chosen and became the new apostle (Acts 1:15-26). The pope and bishops are successors to the apostles, having been called and chosen to continue Jesus' work. 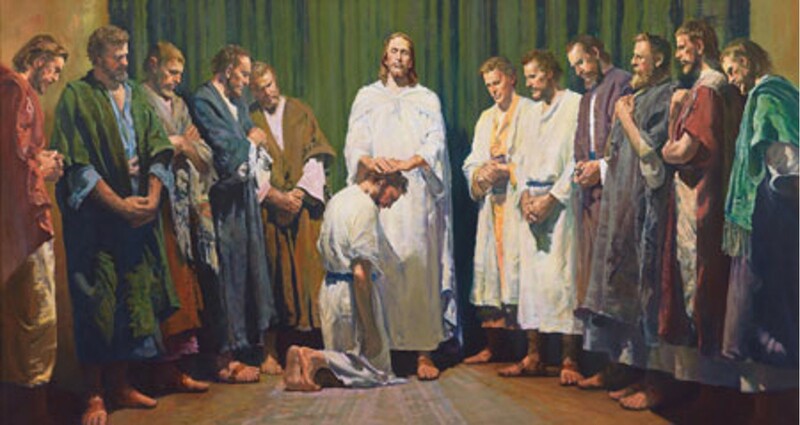 All members of the Church participate in the priesthood of all believers through Baptism. However, some men are called to serve Jesus and the Church through the celebration of the Sacrament of Holy Orders. Holy Orders is the Sacrament through which the mission entrusted by Christ to His apostles continues to be exercised in the Church until the end of time: thus it is the sacrament of apostolic ministry. Through their leadership in the Church, priests help continue Jesus' presence on earth in the tradition of the apostles. Those who are called to be priests are ordained through the Rite of Ordination. In celebrating this Rite, men receive a permanent spiritual mark, called a character, signifying that they represent Jesus' presence in the Church. There are three levels of participation in the Sacrament of Holy Orders: It includes three degrees: episcopate (as bishop), presbyterate (as priest), and diaconate (as deacon). A bishop receives the fullness of the Sacrament of Holy Orders. He is the head or Ordinary of the local Church. The area entrusted to him is called a Diocese or Archdiocese. A bishop is also a member of the Episcopal college, which is all the bishops who, with the pope, guide the Church. Priests serve the community in various ways. They may be called to serve in their Dioceses and/or as religious order priests, carrying out the mission of a particular religious community. They preside at liturgies, preach, administer the Sacraments, counsel people, serve as pastors, and teach. Deacons are ordained for service in the Church, proclaiming the Gospel, teaching and preaching, baptizing, witnessing marriages, and assisting the priest celebrant at liturgies. Some deacons are studying to become priests; others are married men who are called to remain deacons for life and to serve the Church in this capacity. Priests receive the Sacrament of Holy Orders in the Rite of Ordination. The bishop lays his hands on the head of the candidate and says a prayer asking for the outpouring of the Holy Spirit. In one part of the rite, the candidate lies in front of the altar while the Litany of the Saints is sung or recited. In another part of the rite, a priest's hands are anointed with chrism. In the rite for a bishop, the new bishop's head is anointed.